On Sale Now! Free Shipping Included! 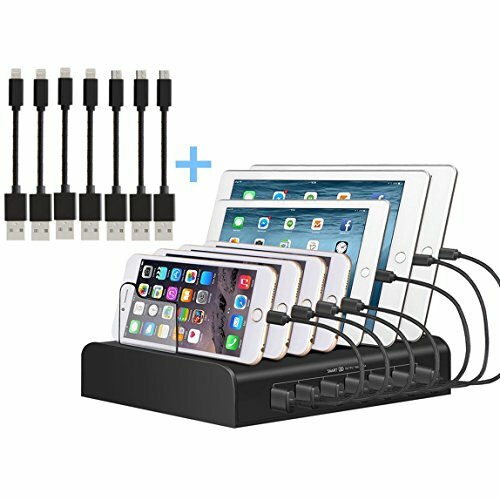 Save 7% on the Kisreal USB Charging Station Smart 7-Port Desktop Charging Stand Organizer for iPhone, iPad, Tablets and Other USB-Charged Devices (7) by kisreal at Got Busted Mobile. MPN: KS7PUSB. Hurry! Limited time offer. Offer valid only while supplies last. SMART CHARGING - Built-in intelligent chip provides identification on your devices and supply exact demanded current for charging. Space Saving - The charger stand can steadily hold all your devices at the same time, no more messy cords bother you anymore, giving you a tidy desktop, Saving you from additional charging adapter or power strip. Easy To Use and Space-Saving Design: Simply connect the 7-Port USB Charging Station to the power adapter and into a wall outlet. MULTIFUNCTIONAL Charging Station: An integrated charging station with USB charger, Charging dock, Desktop organizer and stand for smart phones. And no additional Power Adapter needed anymore. If you have any questions about this product by kisreal, contact us by completing and submitting the form below. If you are looking for a specif part number, please include it with your message.